Abstract-Simulation of IC555 timer used as an audio amplifier is done in NgSpice.The amplifying of input electrical signal and its Pulse Width Modulation by Timer 555 is done which produces a carrier frequency suitable for modulation with input audio signal which will drive the Speaker.The input for simulation purpose is given a sine wave and resultant obtained wave is a square wave with varying width according to amplitude.This wave drives the speaker in Practical Application. 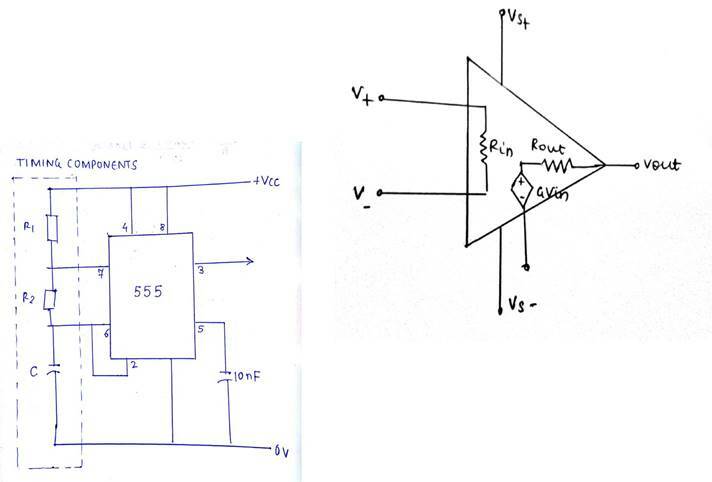 In this project we are describing the principle, design and operation of a low power audio amplifier using 555timer.This 555 timer generates a carrier signal which is modulated by the amplified audio signal to produce a modulated signal. This signal is used to drive a small loudspeaker. Microphone converts input audio signal to electrical signal.This electrical signal is amplified on which Pulse width Modulation is done using IC 555.The output wave drives the speakers which are basically transducers which convert input electrical signal wave into an audio signal. 1) Astable Multivibrator Overview: Earlier Capacitor is discharged thus output goes HIGH.Now Capacitor starts charging from +Vcc by a discharge transistor.It charges till it reaches +2Vcc/3 after which discharge transistor turns ON and output enter LOW state. 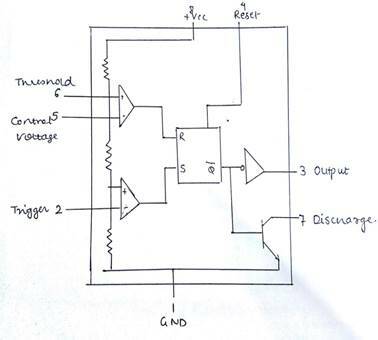 Operational Amplifier commonly known as OpAmp is a linear device fundamentally used as voltage amplifier.The feedback components decide the function or operation.The circuit operates on dual power supply +Vcc and -Vee. First, amplifying of electrical signal and PWM (pulse width modulation). In practical audio input signal is taken through microphone which converts it into electrical signal. For simulation purpose input is considered to be sinusoidal wave.We need to remove the DC component of the electrical signal thus a electrolyte capacitor is used and then fed to the TL071 opamp(low noise). The basic modes of operation of IC 555 timer are-Monostable mode as a precision timer, Bistable mode for flip flop type switching action, and astable mode as an oscillator circuit to produce a stable output frequency adjusted by RC tank circuit. Amplified output is fed to the control pin 5 of 555 timer IC working in astable mode. The control voltage can be varied as desired which affects the width of the output pulse.The input audio voltage is modulated with carrier generated by IC 555 which drives the loudspeaker that is conversion of complex electrical analog signal to soundwave. The input signal is a sine wave of Vpp 10V i.e from -5V to +5V Whereas the output is a square wave with varying width of amplitude +16V. Speaker responds to d.c value of modulated output.Hence audio signal is modified. Developing low power music system that can be used in limited areas like in a vehicle or classrooms. 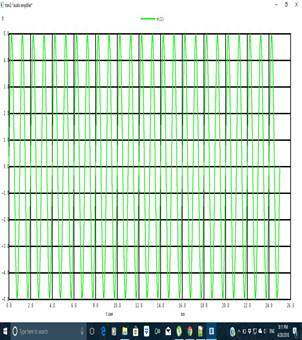 Generation of carrier frequency for modulation of low audio signals. Circuit expansion for high power loud speakers. The timer cannot produce a 50 percent duty cycle signal. A complex demodulation circuit will be required. 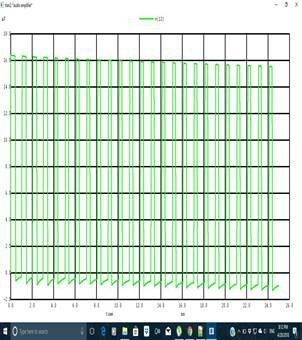 This circuit is theoretical and may require changes in hardware implementation.